1 of 4 Peel pears and trim bottoms so they stand flat. Use melon baller to remove seeds from the bottom of pear, leaving a cavity in base of pears. Place them in a large bowl with the juice of half a lemon and 1-1/2 cups water. 2 of 4 In a large deep pot, combine wine, sugar and cinnamon stick. Bring to a boil, then reduce heat to medium low. Place pears on their sides in pan. Cover pan; bring liquid back to a boil, then reduce heat and simmer 12 to 15 minutes or until knife-tender in thickest part of pear, turning pears occasionally to cook evenly. Carefully remove pears to a plate to cool. Cover with plastic wrap and refrigerate for up to 1 day. 3 of 4 Pour off half of the remaining poaching liquid (you will discard about 1-1/2 cups). Add 1 cup pomegranate juice to remaining liquid and bring to a boil; cook over medium-high heat until slightly thickened, about 5 to 7 minutes. Watch closely because it burns easily. Stir 1 tablespoon pomegranate juice and cornstarch until smooth. Reduce heat slightly, stir in cornstarch mixture and cook about 1 minute until thickened. Let cool, then cover and refrigerate until ready to serve. 4 of 4 To serve, let pears and sauce come to room temperature. Divide sauce evenly among 8 plates. 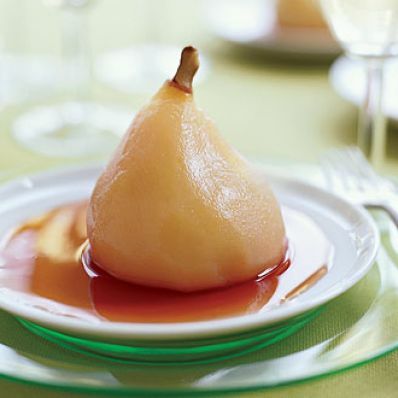 Place pear on top; scatter pomegranate seeds over sauce, if using.